"Will she have the power... to survive?" 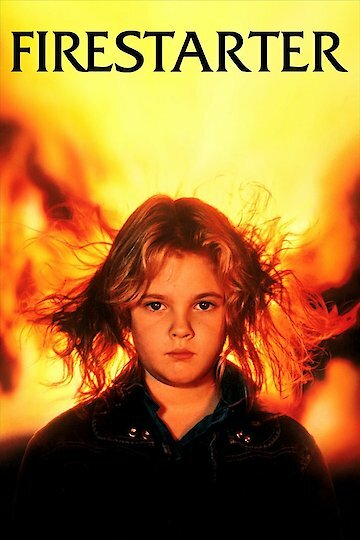 Firestarter, based on a novel of the same name by Stephen King, is the story of a little girl who can cause things to bursts into flame using only her mind. This power, called pyrokinesis, is almost impossible to control and Charlene (Charlie) McGee is terrified of what she might do if it were ever fully unleashed. She may not have a choice, however, as she and her family are relentlessly pursued by sinister government agents. The Shop, a shadowy intelligence service dedicated to paranormal investigation, was responsible for conducting experimental medical tests of powerful hallucinogenic drugs. College student Andy McGee (David Keith) meets his future wife Vicky (Heather Locklear) at a paid clinical trial for a drug called Lot-6 which permanently alters their brains and leaves them with psychic powers. Vicky gains a limited ability to read minds, while Andy is able to do what he calls Pushing. A light Push can convince someone to quit smoking or tear up a traffic ticket, while a strong Push can permanently blind, madden, or drive them to suicide. The Shop seemed content to allow the McGees to marry and live in peace, but when their daughter begins to show signs of psychic abilities far more powerful than either parent's, government agents attempt to kidnap Charlie for further study. Vicky is brutally murdered and Andy and Charlie must escape with their lives. Andy is able to push people into helping them, but his ability has begun to cause headaches and nosebleeds and he fears that overuse may cause brain damage or death. Father and daughter are relentlessly pursued, but The Shop gets more than it bargained for in forcing Charlie to learn control over her abilities. Charlie (Drew Barrymore) is forced to grow up too soon, and her captors soon regret under-estimating her as she and her father make their escape from The Shop's experimental facility in an apocalyptic, action-packed climax. Firestarter is currently available to watch and stream, buy on demand at Amazon, Vudu, FandangoNow, iTunes, YouTube VOD online.